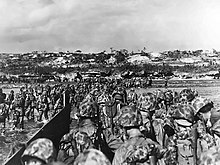 The Battle of Okinawa is considered to be the last major battle of World War II. 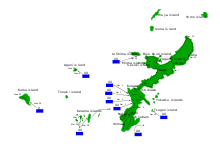 The Americans were planning Operation Downfall, the invasion of the four great islands of Japan. This never happened, since the Japanese surrendered after the American use of the atomic bomb in August 1945 (first in Hiroshima, and a second time in Nagasaki) and the Soviet Union declaring war on Japan. 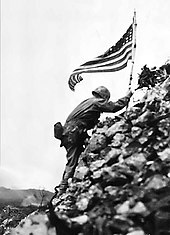 Some battles, such as the Battle of Iwo Jima, had no civilians present, but Okinawa had a large civilian population. The civilians killed or injured in the battle were at least 150,000. 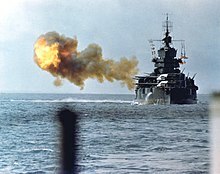 American deaths were 18,900 killed or missing and 53,000 injured, more than double of the soldiers killed at Iwo Jima and Guadalcanal put together. Several thousand soldiers who died from wounds and other causes after the battle had finished, are not included. About a third of the civilian population of the island were killed. The Japanese had lost up to more than 1,100 planes in the battle. 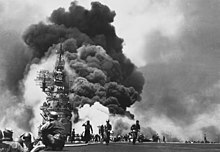 Buckner launched another American attack on 11 May. By the end of May, monsoon rains turned hills and roads into mud. ↑ 3.0 3.1 Rottman, Gordon (2002). 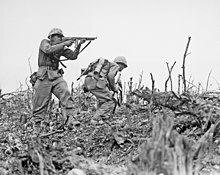 Okinawa 1945: The last Battle. Osprey Publishing. p. 38. ISBN 1-84176-546-5. ↑ 4.0 4.1 Rottman, Gordon (2002). 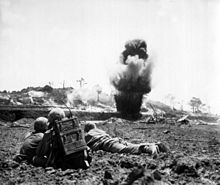 Okinawa 1945: The last Battle. Osprey Publishing. p. 40. ISBN 1-84176-546-5. ↑ "World War II Casualties". Naval History and Heritage Command. 30 April 2015. Retrieved 20 February 2016. ↑ "OKINAWA: THE LAST BATTLE, Chapter 4, Page 102". Retrieved 11 June 2012. ↑ "Action in the North, Chp 6 of Okinawa: Victory in the Pacific by Major Chas. 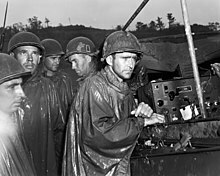 S. Nichols, Jr., USMC and Henry I. Shaw, Jr". Historical Section, Division of Public Information, U.S. Marine Corps. Archived from the original on April 13, 2010. Retrieved May 7, 2010. 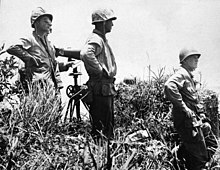 ↑ ""The World is beginning to know Okinawa": Ota Masahide reflects on his life from the Battle of Okinawa to the Struggle for Okinawa". Japanfocus.org. Retrieved 2012-05-06. This page was last changed on 21 February 2019, at 18:22.